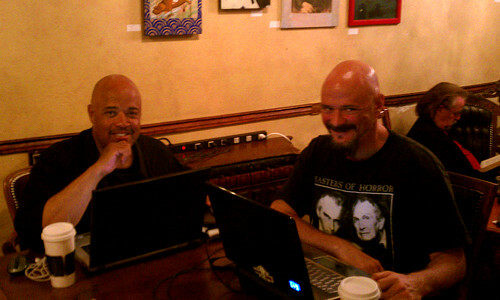 Last night writer Jimmy Diggs (STAR TREK: DEEP SPACE NINE, STAR TREK: VOYAGER) and I met at Lestat’s Coffee Shop to work on two of Jimmy’s creations projects, the Science Fiction time travel Steampunk Alternate History movie, HMS VICTORY and the animated SciFi COOCHIE ROGERS: Space Bounty Hunter (to be voiced by Vivica A. Fox!*). I’ll be producer on both and acting in the teaser trailer for HMS VICTORY (as Dr. Feo Amante), Spotlight On CryptoHistory! Thrills! Adventure! Time Travel! Science! Currie! Carver! Wells! Tesla! Elvis?